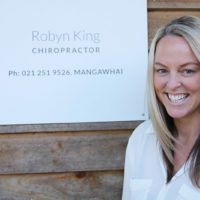 Coast Chiropractic, effective and friendly chiropractic care and therapeutic massage in Mangawhai Heads from Robyn King. Come in and meet Robyn. Easing your aches and pains through effective care. Coast Chiropractic is a friendly well-established healthcare clinic located in Magical Mangawhai Heads. At Coast Chiropractic we provide safe effective chiropractic care, massage therapy, midwifery services and physiotherapy. Coast Chiropractic is a multi-disciplinary practice providing a range of services including chiropractic, massage therapy, midwifery and physiotherapy. The clinic has expanded to provide locals and tourists with a variety of treatments suited to their needs. All practitioners at the clinic are very experienced and highly skilled. Chiropractor Robyn King is the principal chiropractor and Director at Coast Chiropractic, providing effective safe care for people of all ages. I don’t know how much I could improve until I started seeing a chiropractor. I’ve improved by leaps and bounds both mentally and physically. I’ve been going to chiropractors for as long as I can remember. It’s as important to my training as practicing my swing. The doctor of the future will give no medicine but will instruct his patient in the care of the human frame, in diet and in the cause and prevention of disease. Coast Chiropractic would love to help you, get in touch today!